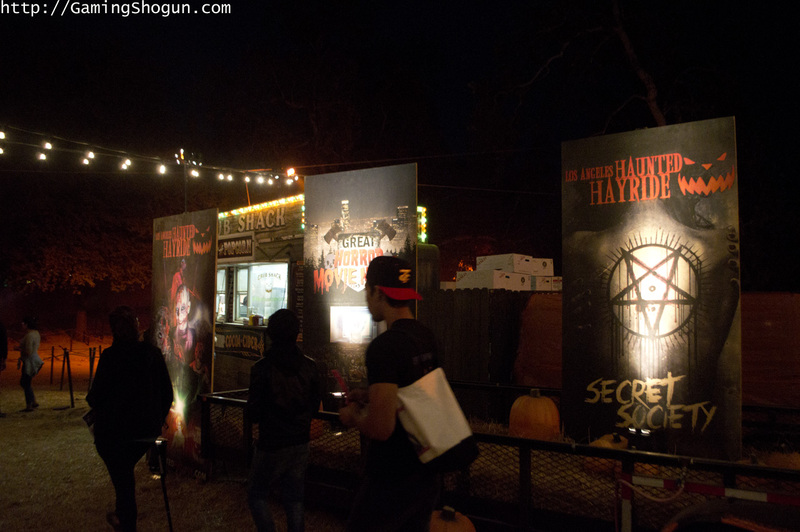 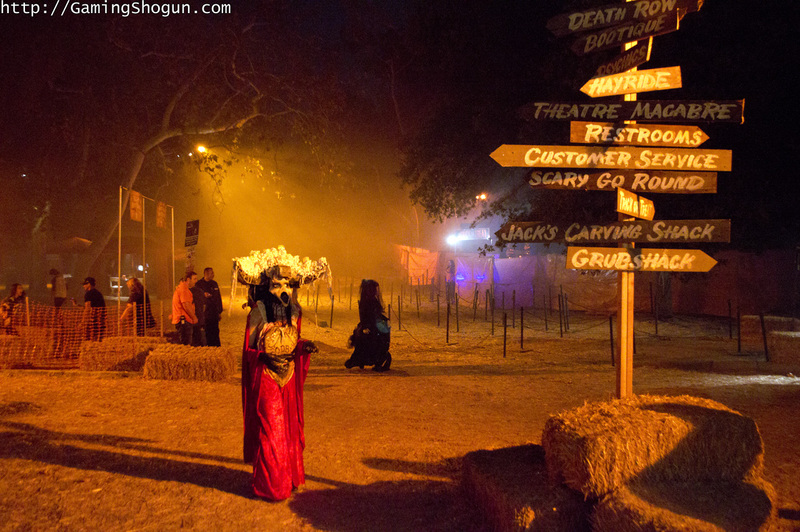 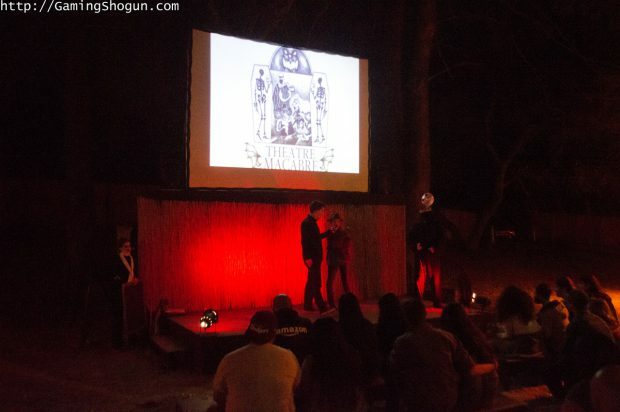 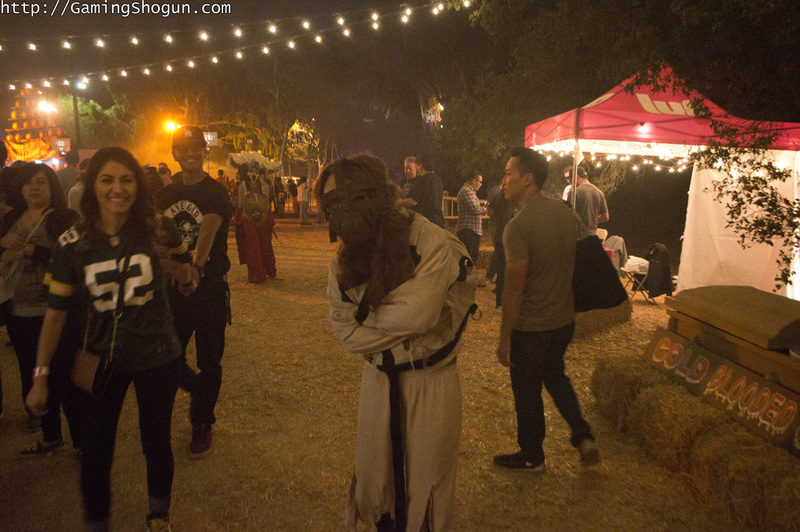 In our 2015 review of the LA Haunted Hayride, we were disappointed with the overall vibe of the event as well as the hayride attraction itself – it seemed distracted or halfhearted (my assumption was that running the hayride in both NY and LA was taxing on their resources). The LA Haunted Hayride was, for five years running, my favorite haunted attraction in Southern California up to that point. 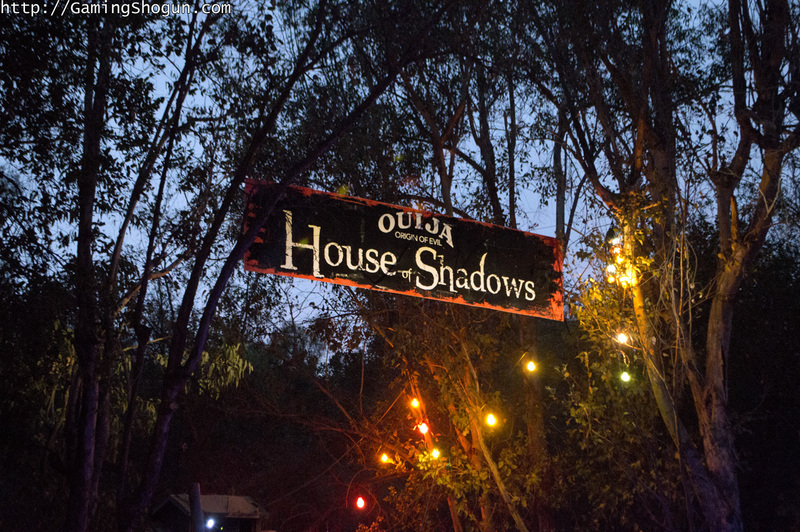 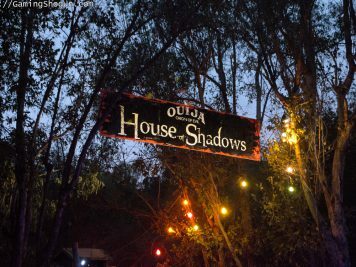 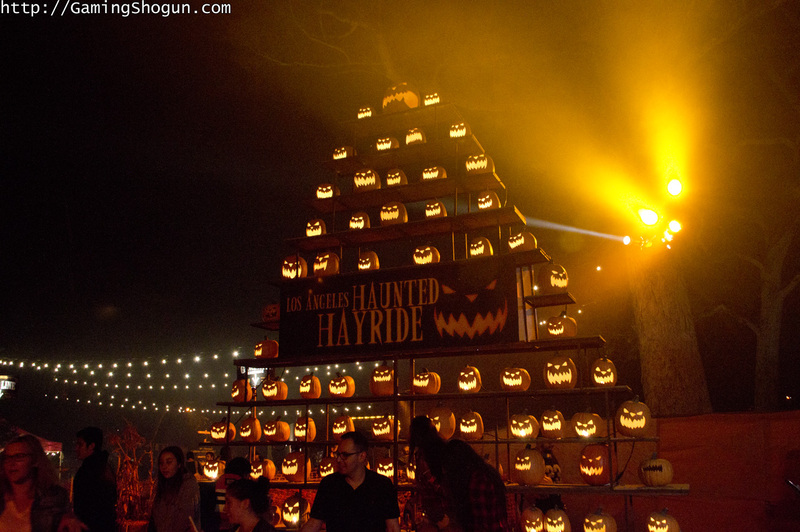 Thankfully, the LA Haunted Hayride has rebounded since last year, bringing back that Midwest Halloween Carnival vibe it seemed to lose while also infusing new life into the hayride attraction. 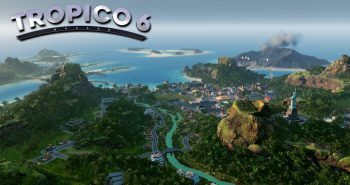 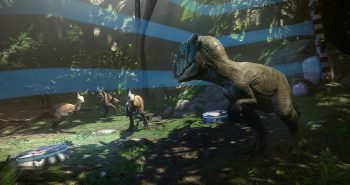 Read on to find out how they came back and why you should make plans to go! 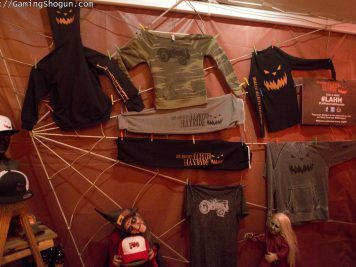 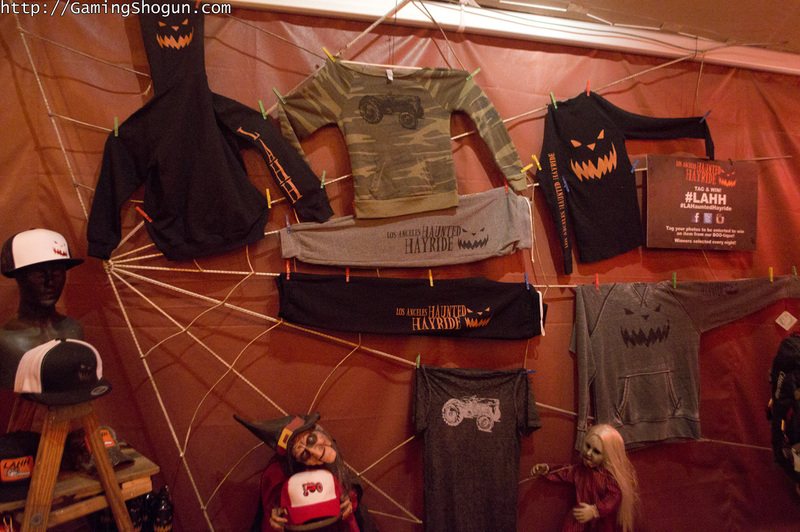 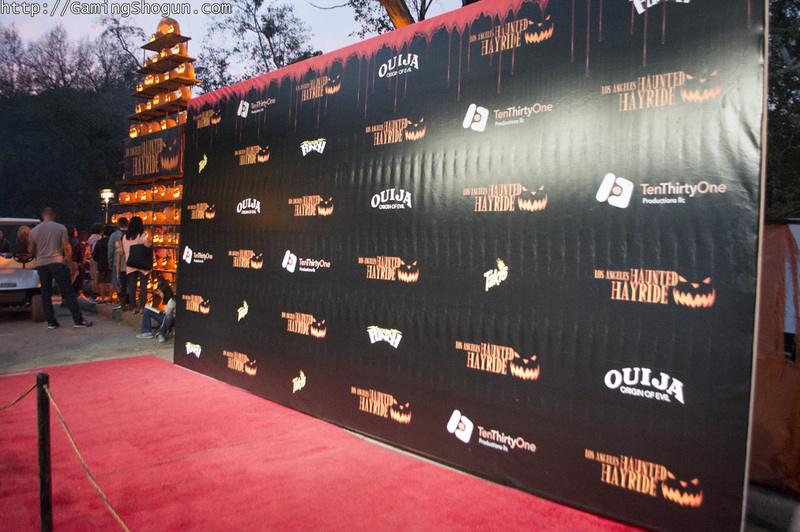 We usually start our LA Haunted Hayride media night with some photos from the red carpet but wanted to focus on the haunted attraction proper because of its rebuilding year in 2015. 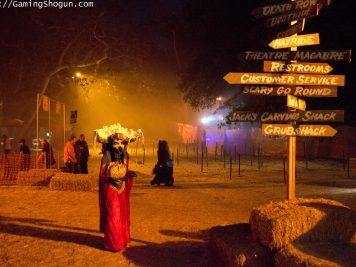 Entering the location past the ticket counter, we were treated to several monsters working their scares and impressing guests with their imaginative costumes. 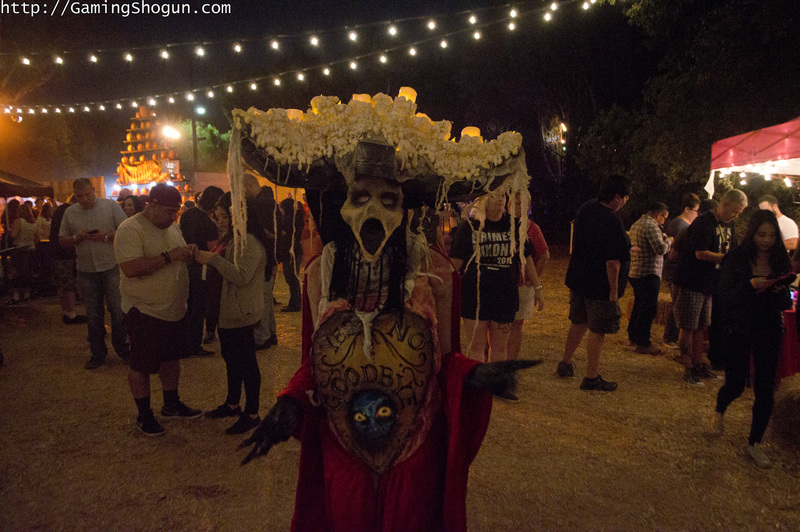 The LA Haunted Hayride character designers are to be commended by their efforts as they are not afraid to push the envelope in terms of gore and technology. 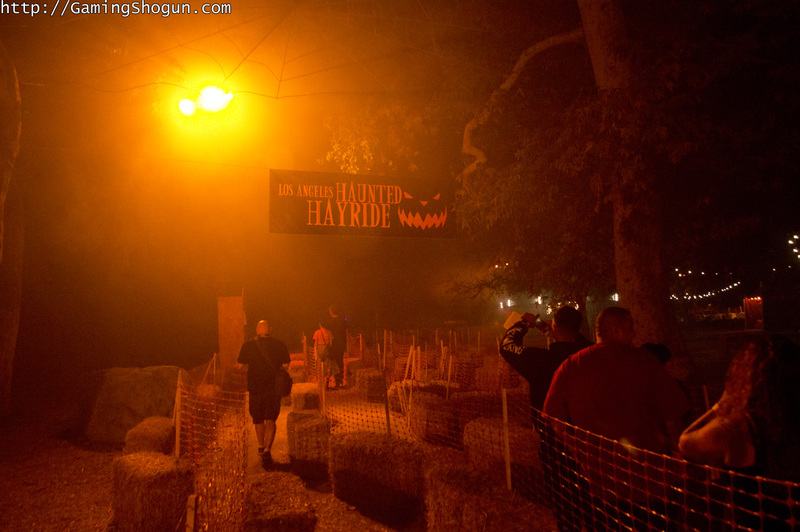 The hayride attraction starts out very similar in format to past years. There are two lines leading up to the ride – VIP and General Admission, and guests are shuffled into two holding pens just before the tractor and wagon approaches. 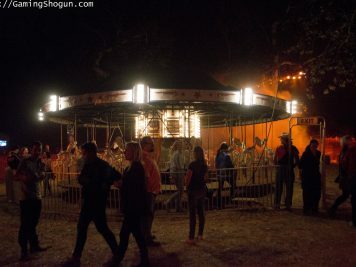 We boarded the wagon and were told that we could take video and photos so long as there was no flash or light – this is a big change as they usual prohibit photos and videos altogether. 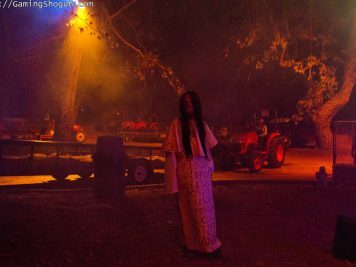 After getting seated on the bed of hay, the wagon started moving and we began our journey. 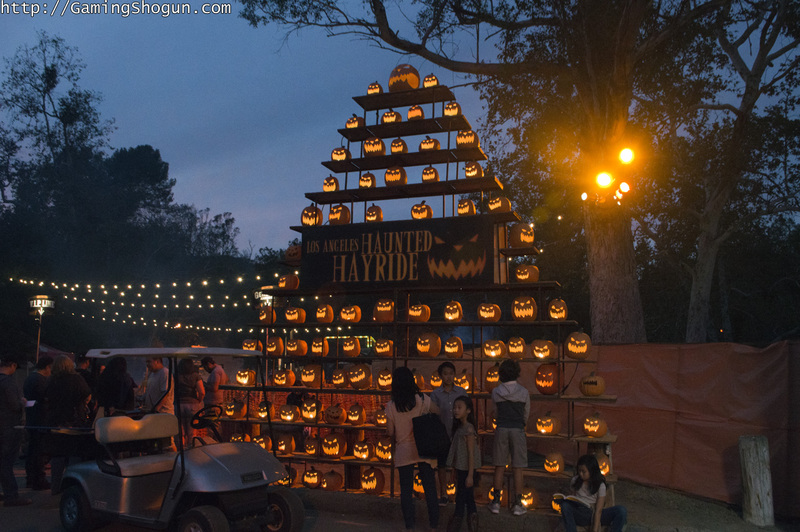 This year’s hayride theme is “Secret Society” and involves guests being indoctrinated into the secret society of Halloween. 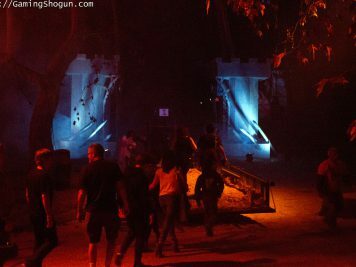 In a cool homage to Indiana Jones and the Forbidden Journey ride at Disneyland, wagons are sent left or right and on the path of the “Elites” or the “Deranged”. 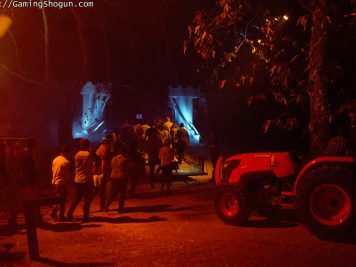 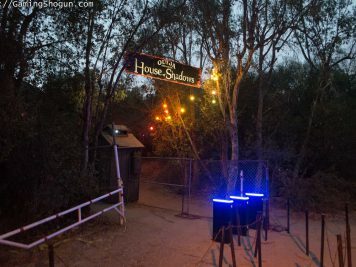 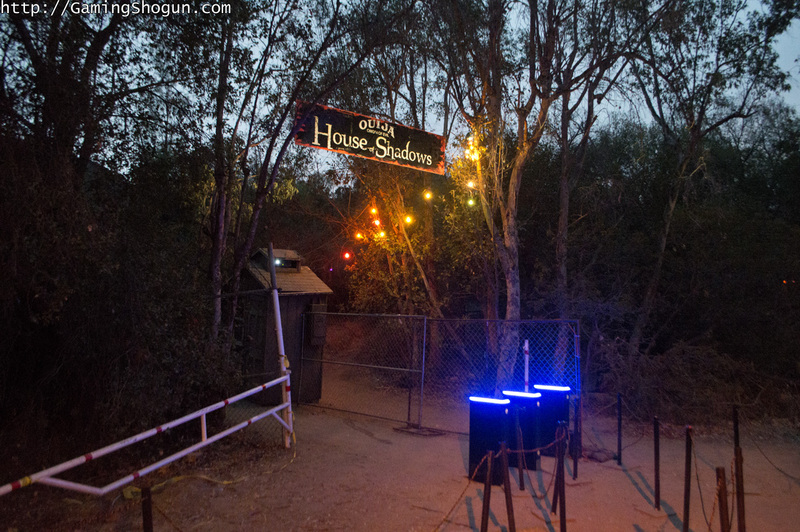 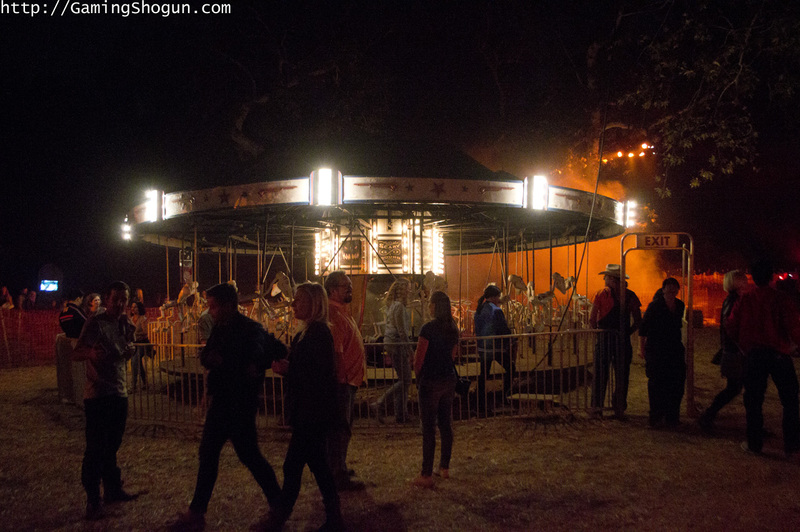 What is really interesting about this year’s hayride is that guests actually disembark the wagon midway through the ride and walk through a small haunted house inside the Old Zoo area of Griffith Park. 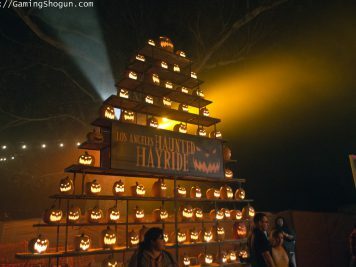 This small haunted house was fun and different but a bit one-note with an overuse of corn stalks. 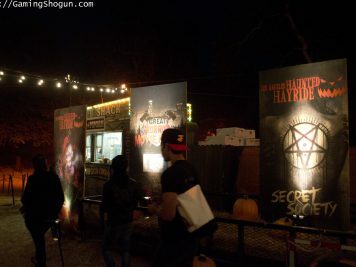 I didn’t see much of the secret society theme inside and, overall, I hope that part of the experience is more entertaining next year. 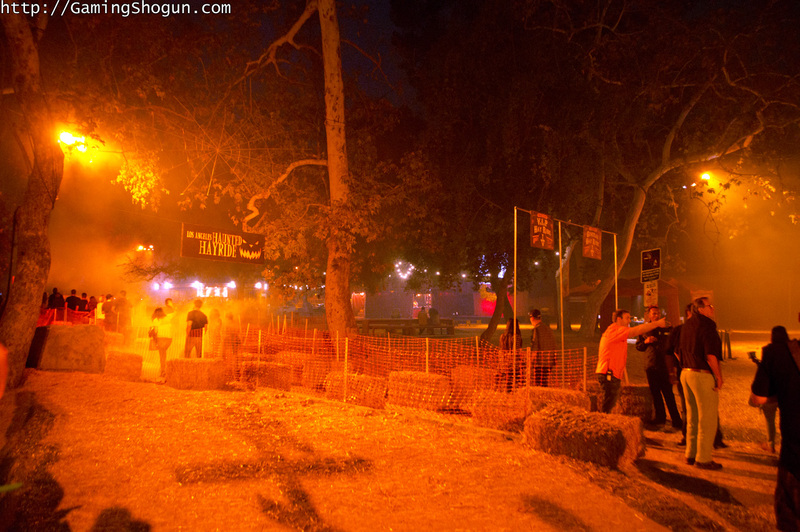 Once through this mini-maze, guests get back on the hay wagon and resume the hayride. The remaining hayride set pieces were entertaining and, for the most part, fit the theme of the secret society indoctrination. 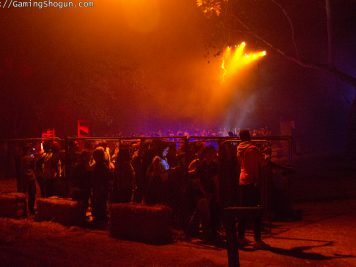 Everyone seemed to be having a good time and, overall, the hayride was a lot more fun than last year’s. 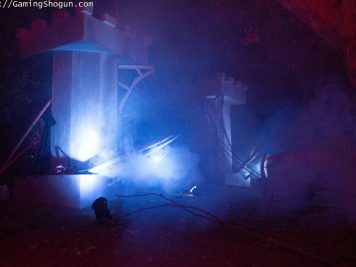 I can’t say it was scarier or better than a few year’s ago when they had some VERY large set pieces and more open areas in between them, but it is definitely worth taking a ride on. 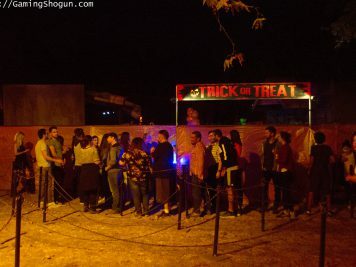 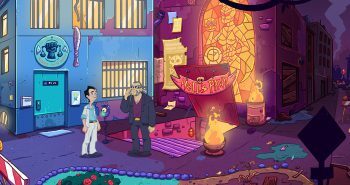 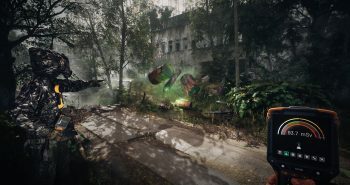 Trick or Treat is a haunted house in the not-so-traditional sense in that it is actually a trick or treat simulation set in a haunted village. 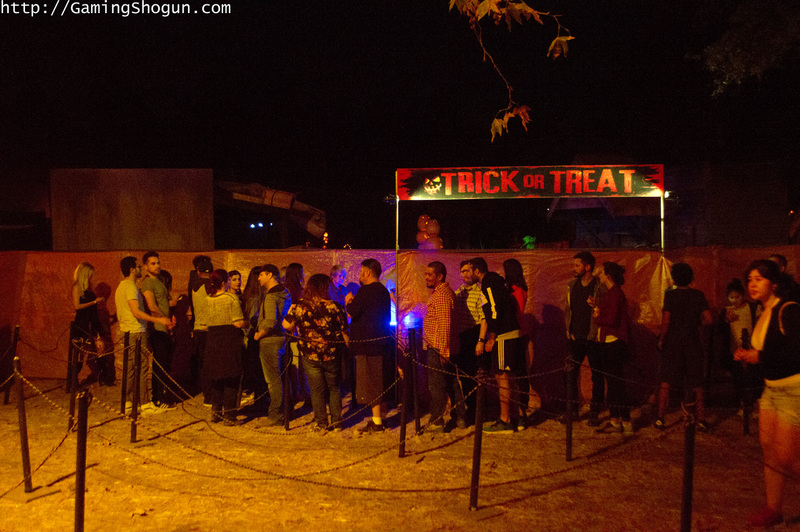 Guests go inside Trick or Treat in small groups and go door to door, trick or treating! 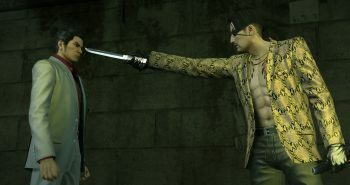 I loved this concept and their execution of it was perfect. Each facade had a different theme and the monsters all had their own defined characters. 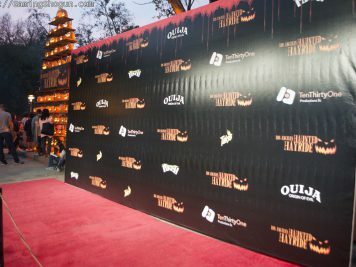 Guests can thank Sour Punch candy for sponsoring this one and providing the candy. 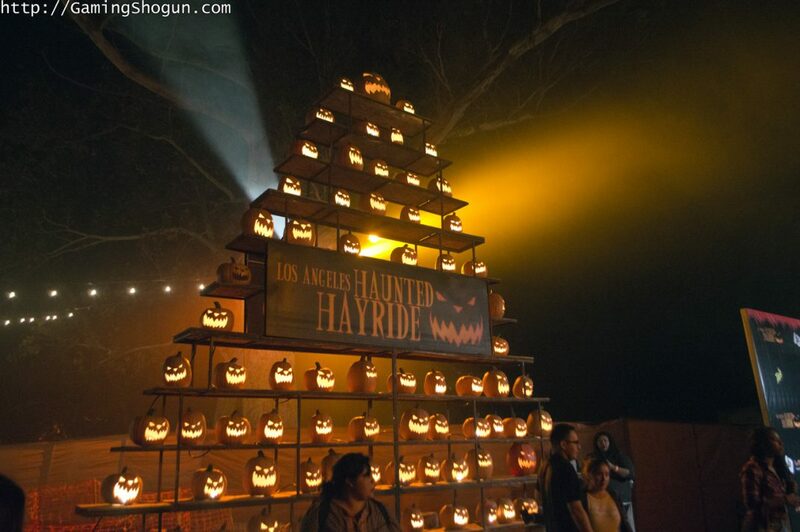 I hope that the LA Haunted Hayride brings this back next year – possibly even in a more expanded role – can never have too much trick or treating, especially when it is presented so well! 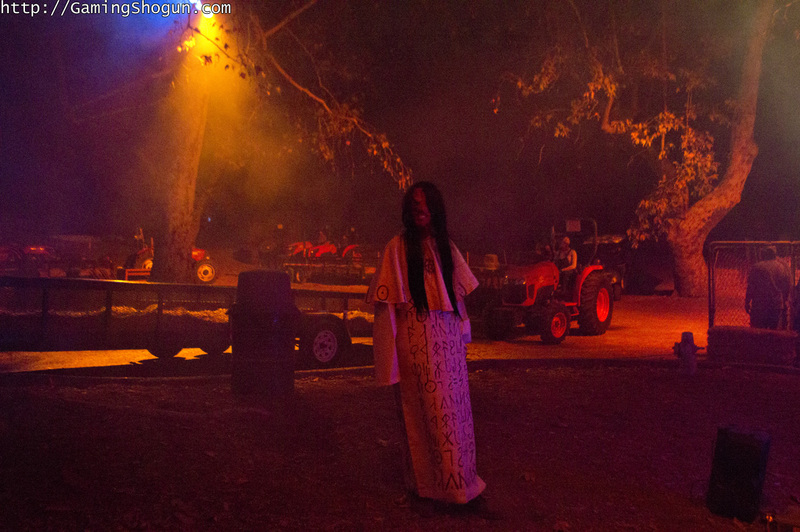 The Purgatory area of the LA Haunted Hayride has not changed very much. 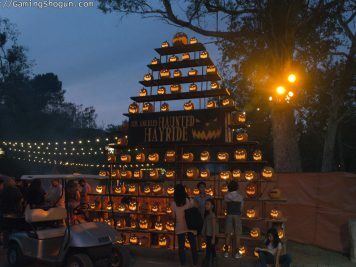 The pumpkin carving station is a bit smaller this year and the photo gallery has been updated from my last memory of it. 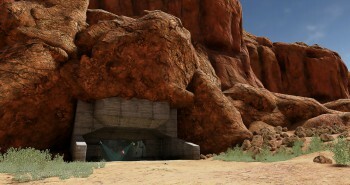 It is still a great place to take pictures with the rest of your group. 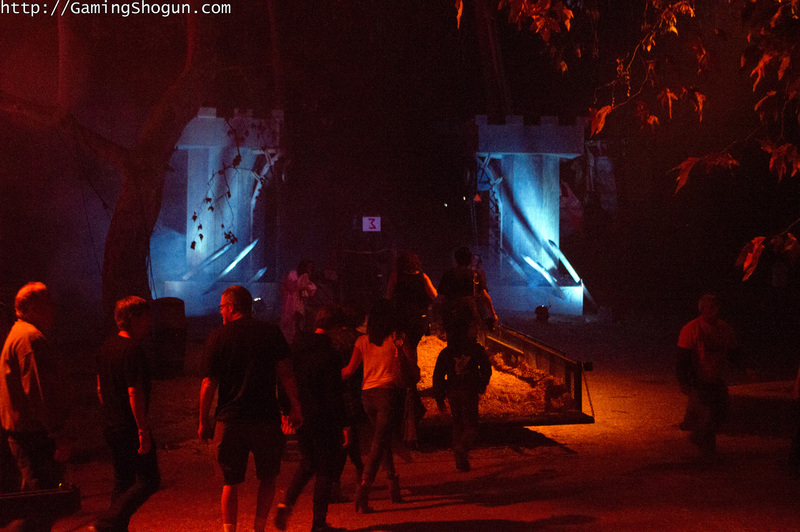 There is a guillotine and some other objects setup near the hayride line but we didn’t see it being used. 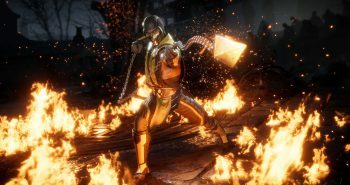 I would love for them to bring back the flayed pianist they had some years ago, but I digress. 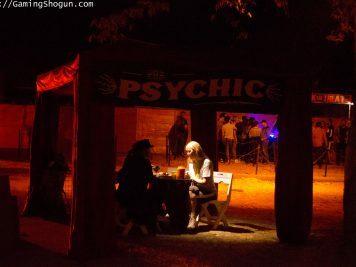 The psychics are still there to do palm reading as are the stage shows while the merry go round is still in operation. 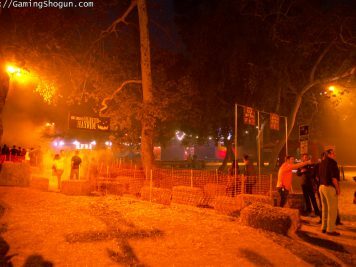 They did not bring back the spooky food vendors like the candy apple guy seen in pre-NY Haunted Hayride years, but there was a food cart being pushed around to help guests avoid snack shack lines. 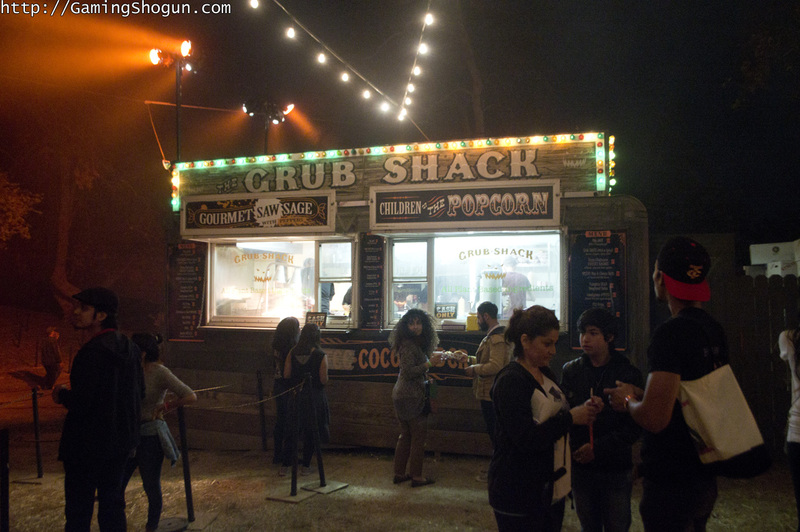 The food being sold at the food cart is the same as the snack shack, so on busy nights it might save you some time. 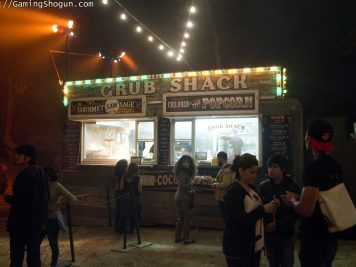 Speaking of food, the “Grub Shack” has returned and has the same food fare as last year. 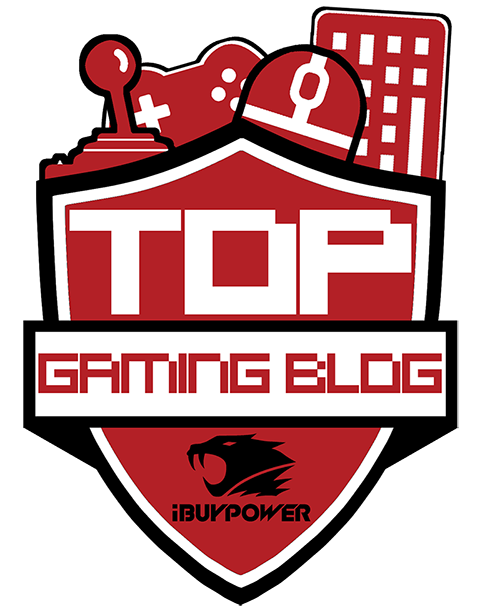 While tasty, they are still putting cold caramel sauce on green apple slices instead of hot caramel – this really needs to change. 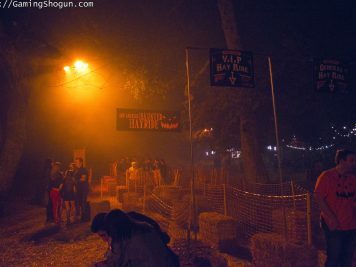 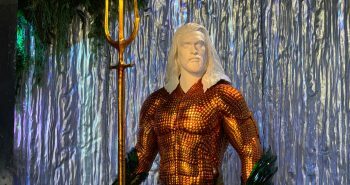 The popcorn was decent and the pumpkin beignets were good – definitely check those out and grab a cup of hot cocoa before it sells out – they don’t restock during the night. “Ouija, Origin of Evil” Dark Maze is the latest incarnation of their venerable dark maze haunted house. 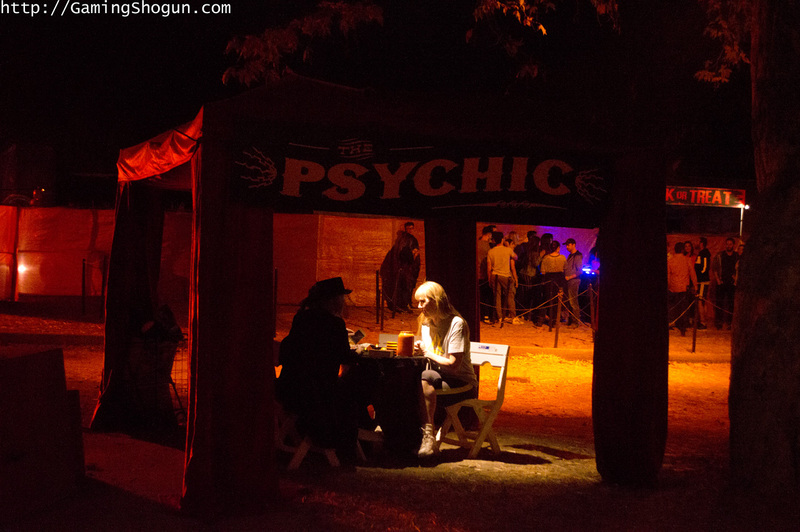 As you might have guessed, this year’s dark maze was sponsored by the new horror film “Ouija, Origin of Evil” and was a good deal of fun. 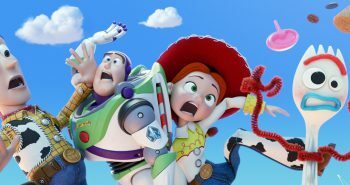 This is especially true if you have a group of people as opposed to just one or two individuals. 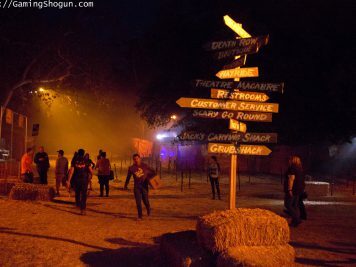 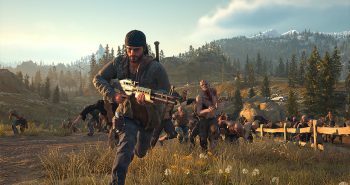 A group of people stumbling through the darkness gets downright comical in between the scary parts and everyone seems to have fun laughing at getting lost. 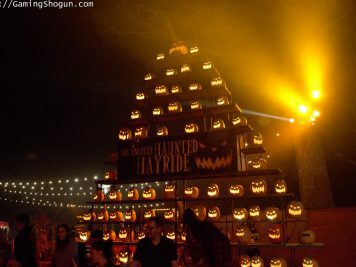 Ticket pricing ranges from $32 dollars for just a ride on the hayride to $44 dollars for general admission to all the attractions. If you want to upgrade to front of the line access, it will cost you $60 dollars a person. 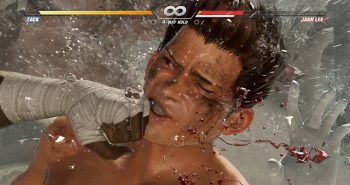 As far as value is concerned, I would say the $44 dollar ticket is absolutely worth your money. 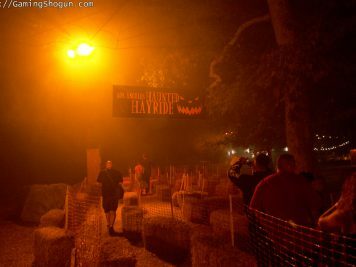 The $60 dollar ticket is a bit pricey – especially if the hayride is not highly populated with guests – say, on a Sunday night or something. 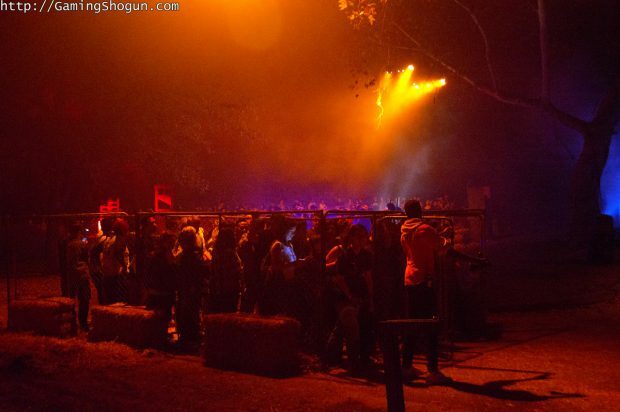 But, if you absolutely can’t stand waiting in line then that ticket price is for you. 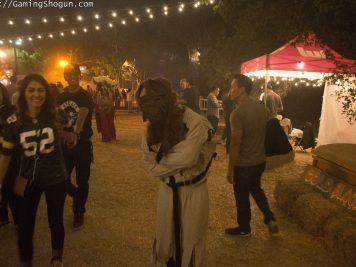 Overall, the 2016 LA Haunted Hayride is a fun experience that more than makes up for its lackluster 2015 event. 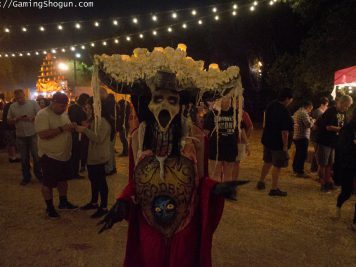 The Midwest Halloween carnival vibe is definitely back and, while they still have a little ways to go in terms of getting back to the level of scares and fun they had a few years ago, it is well worth your time. 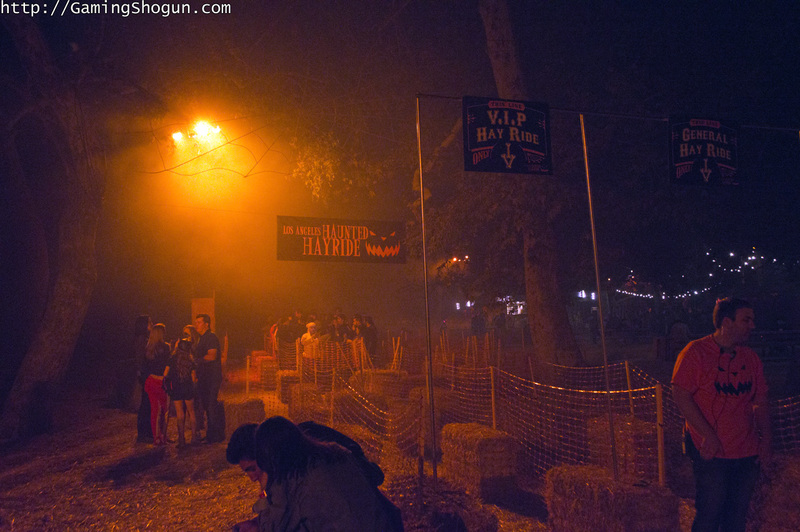 You can find event dates and ticket information over at the LA Haunted Hayride’s official website.